** I’ve been re-visiting old posts. Here is one that resonates well with me today. Have you ever tried to juggle balls? I once had a friend who was a master juggler. He could juggle six or seven balls at a time, sometimes bouncing them, sometimes throwing them in the air. He was amazing. One day he took me out to the park and taught me how to juggle. You toss one ball with the right hand and catch it with the left hand, while you’re also tossing another ball with the left hand and catching with the right. You’re eyes, however, never leave the balls that are in the air. The secret is to get a rhythm going, tossing the balls to the same height every time so that the catching and the tossing all happen in a predictable manner. It’s really quite a beautiful thing once you get the hang of it. In the beginning, while you’re learning how to juggle, you drop lots and lots of balls. But eventually, if you keep at it, you learn the rhythm of it, and you learn to focus on doing just one thing: catching the next ball. 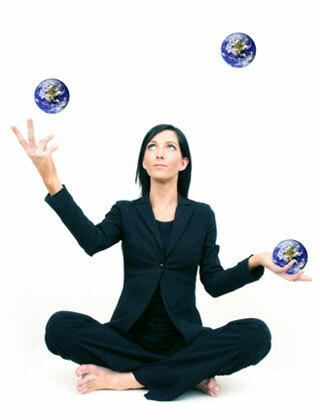 Juggling requires focus and concentration. If you let your mind wander, or if you take your eyes off the balls in the air, you lose it and balls go flying everywhere. The secret to doing it well is consistency: tossing the same number of balls the same way every time. When you add more balls to the mix, then you have to learn to readjust your toss, so that you have time to catch each ball in its turn. You can see where I’m going with this metaphor, because life really is quite a bit like juggling. We are each of us learning to juggle all of our varied responsibilities: we go to work, spend quality time with our families, keep in touch with our friends, volunteer at church or in our community, feed ourselves healthy food, get lots of fresh air and exercise, work on our hobbies, take care of our house and our car, do the laundry, wash the dishes, take out the trash, write a blog, go to band practice, learn new music, wash the dog, attend all the necessary networking events, check in at Facebook and Twitter on a consistent basis, oh, and don’t forget to get plenty of rest. It’s not surprising that from time to time we drop some balls. Juggling balls is a bit easier than juggling our lives, because balls are always the same. If you start with a ball that fits in the palm of your hand, that ball will always stay the same size. Not so with real life. In real life we go through seasons where one area of our life requires more of our attention, and it crowds out other areas. When that happens, we’re forced to let some balls drop. For instance, I have a business colleague who just found out that her husband is seriously ill, so she made the wise choice to let many of her balls fall to the ground so that she can focus all of her attention on him. She’s juggling with fewer balls now so she can focus on the balls that matter. In my own situation, the ball called work went from a tiny little thing that barely took up three or four hours a day to a huge 12 to 18 hour a day monster ball that took every ounce of energy I could muster for several weeks. I was forced to drop several balls during that time, one of which was this blog. Some of the balls that I dropped in the past few weeks I’ve chosen to leave on the ground and not pick back up. I’m sure there are people out there who will be unhappy about that, but they’ll get over it. When our lives change, which they always do, it forces us to re-evaluate what is important to us, and to let go of those things which no longer serve us so that we have time to focus on what’s important. This blog is important, both to me and to the handful of people who read it every week. So to my loyal readers, I offer my apologies for my absence, and my assurance that I do plan to keep this ball in the game. Much like my friend with the sick husband, I’ve chosen to juggle with fewer balls so that I can focus more completely on what’s important. I’ve left some balls lying on the ground so that I can give more time to the balls called Writing, and Singing, and Home. Stay tuned to this site for more weekly articles on Gratitude, as well as some new daily features. And if you find yourself dropping balls in your own life, forgive yourself. It’s all part of the game. I love the analogy. It’s quite apt. Solomon, thank you. I checked out your blog, and am delighted with your site. I’m new at the gratitude thing, but I see that you’ve been practicing gratitude for quite some time. I especially liked your daily rating system. Thanks for sharing.